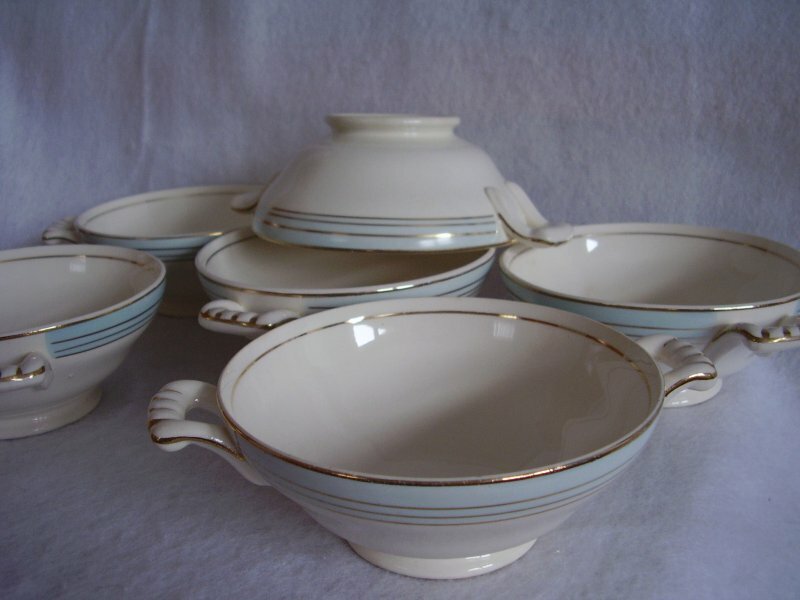 Edwin M. Knowles semi vitreous china lugged soup bowl, a set of 6. 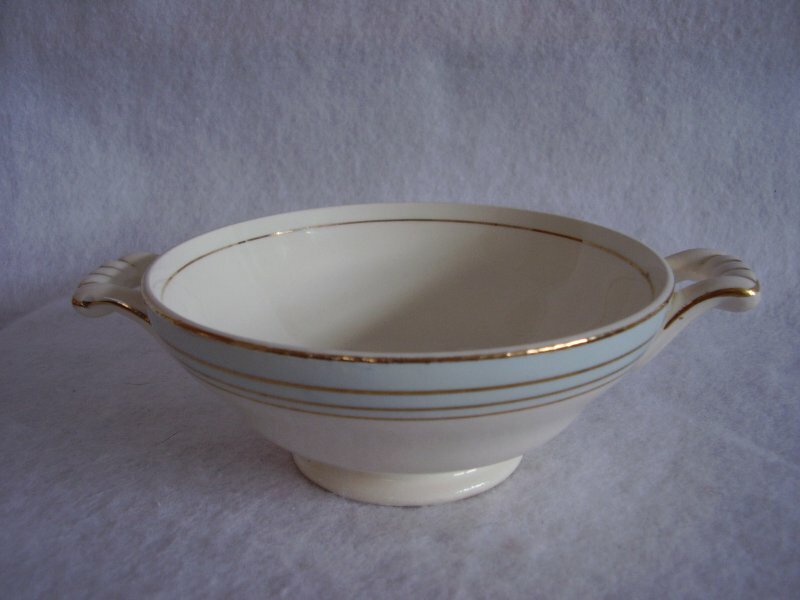 Pristine white with blue bordering at the top of the bowl and trimmed in gold. 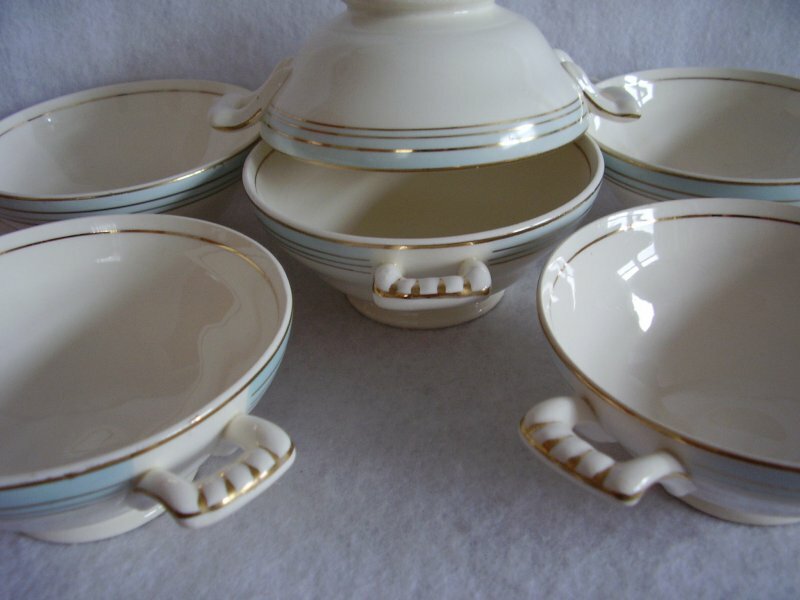 The handles are also trimmed in gold. Manufactured in the 1940's. 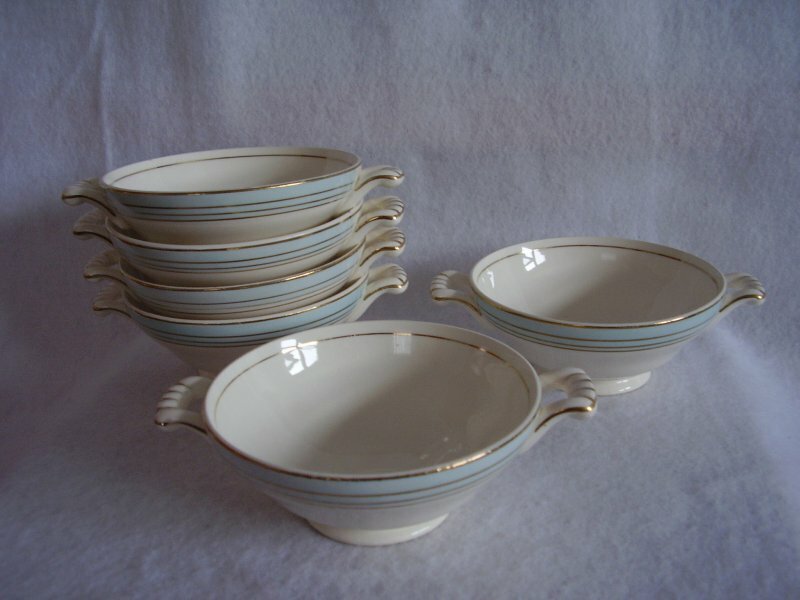 Edwin M. Knowles semi vitreous china lugged soup bowl, a set of 6. 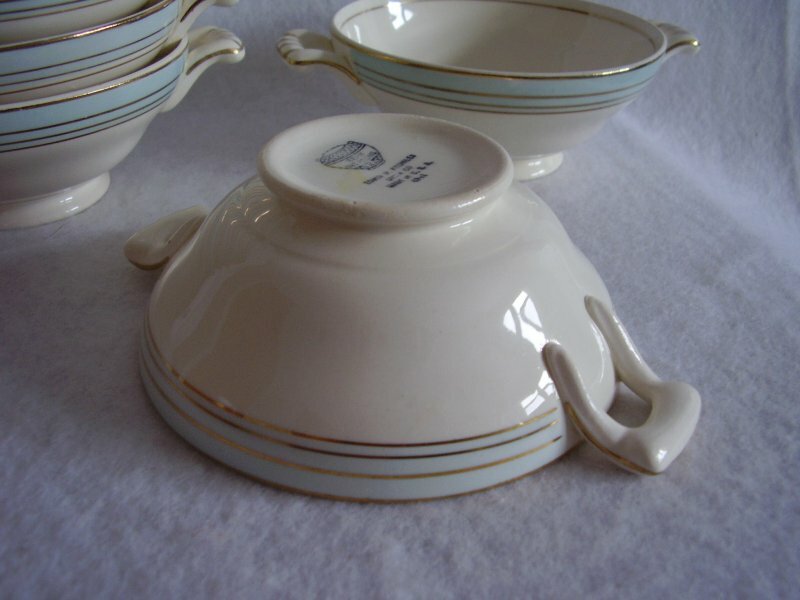 Pristine white with blue bordering at the top of the bowl and trimmed in gold. The handles are also trimmed in gold. Manufactured in the 1940's. Exact pattern name is unknown. 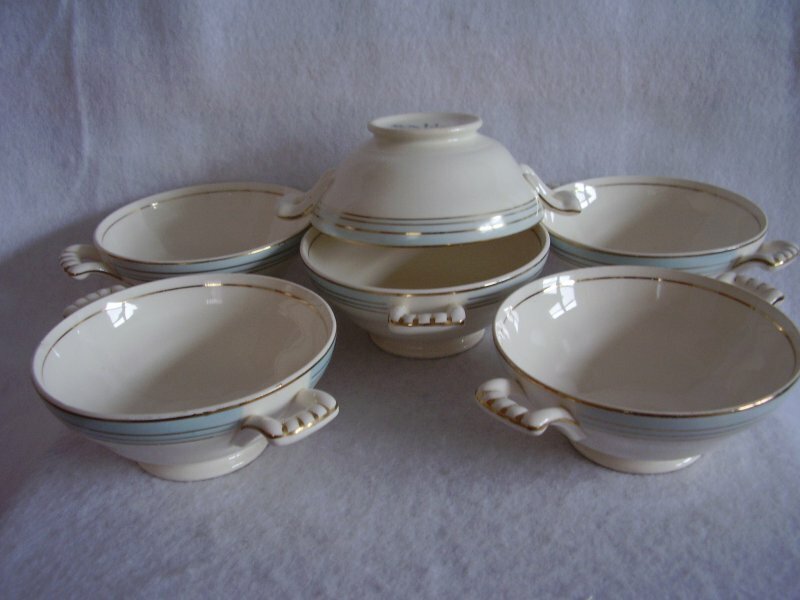 Each bowl measures 2 inches tall, 5 1/8 inches in diameter and is 6 3/4 inches across the handles. Holds 8 oz. The back stamp has the late vase mark, it has the 5 central diamonds in the bottom crosshatching. 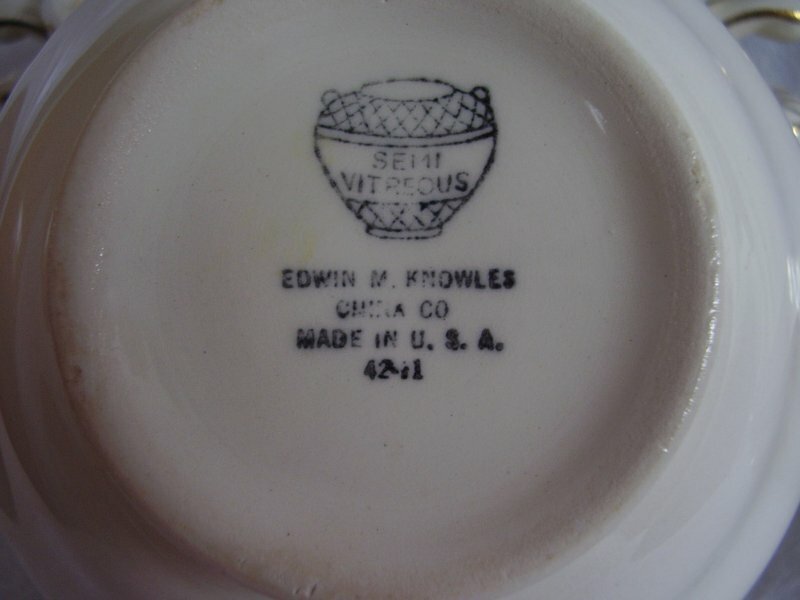 Edwin M. Knowles China Co. Made in U.S.A. 42-12. 1. Has one tiny pin size fleabite near the rim and very, very faint utensil marks. This bowl has crazing both inside and out. 2. Has one tiny pin size fleabite near the rim and very, very faint utensil marks. Very tiny manufacturing flaw on outside near rim - nothing serious. 3. There is a small scratch on the outside, nothing serious, two small, very lightly discolored areas inside and very faint utensil marks. 4. Has very, very faint utensil marks . 5. Has one tiny pin size fleabite near the rim and very, very faint utensil marks. 6. Has very, very faint utensil marks.